Take note Nightmare Before Christmas collectors, this is the poster you've been looking for to complete your collection! Produced and written by Tim Burton, and directed by Henry Selick, the inventive stop-motion film tells the story of Jack Skellington, the Pumpkin King of Halloweentown who wishes to bring Christmas cheer to his haunted neck of the woods, leading to disaster. This 3-D style advance poster was produced in very limited quantity, and is extremely hard to find. It is made out of photographic material laminated onto plexiglass that creates a three dimensional effect, known as a barrier strip image in the industry. 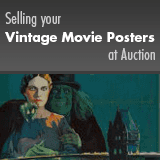 Showing only light surface scratches, the poster is in great condition. Displayed in front of light, it gives an outstanding and eye-popping three dimensional effect that is nothing less than stunning. Very Fine+.